Etiquette dictates forks go to the left of the dinner plate, knives and spoons to the right. 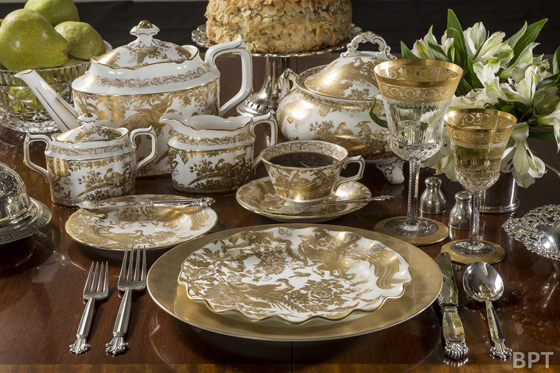 Vujinovic is one of the etiquette experts at North Carolina-based Replacements, Ltd., the world’s largest retailer of old and new china, crystal, silver and collectibles. This time of year the company is bombarded with inquiries from those needing a crash course in proper social graces and entertaining. Questions range from how to set the table to the best way to serve the perfect meal. Buffets settings are becoming increasingly popular. In this style of setting, the host places the food, dinnerware and utensils on a sideboard or table and guests serve themselves. If you’re hosting a seated buffet, water glasses should be filled and on the table before your guests sit down to their meal. 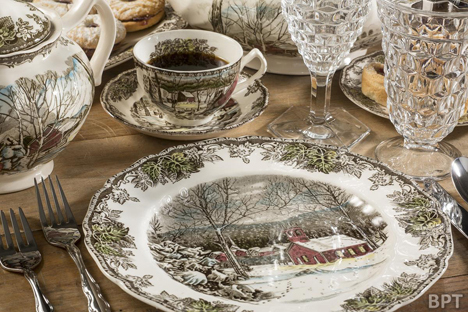 Guests should be guided to pick up their dinnerware and place it at their individual setting. If you opt to set your table in advance or if you’re a buffet guest setting your own place setting, remember, forks go to the left, knives then spoons to the right. The sharp side of the knife blade should be turned toward the dinner plate. And remember, only include utensils in your place setting that will be used for the courses you are serving; extra pieces may confuse your guests. Don’t panic if you aren’t sure about the proper place setting for each meal. Vujinovic says you can find “cheat sheets” or place setting guides for various meals on the company’s website, replacements.com, under the site’s “neat things” tab. Goblets and wine glasses go to the right of the plate. Remember, the host/hostess always sits last. That person will let you know when it’s okay to begin eating. They may offer a blessing or statement or perhaps start by passing a dish. Always pass food around the table counter clockwise to your right and refrain from serving yourself first. Pass the salt and pepper as a set, even if you’re only asked for one. Don’t cut more than one or two bites of food at a time and never butter an entire roll or piece of bread. Instead, pinch off pieces small enough for one or two bites and butter those first. If you need to excuse yourself temporarily, place your napkin on your chair to indicate you will be coming back. Signify you’re finished with the meal by placing your napkin to the left of the dinner plate, and your fork and knife side by side diagonally across your plate with the sharp side of the knife blade facing inward and the fork tines up. Turn your cellphone on vibrate or don’t even bring it to the table. Enjoy the company of those around you. And what if you commit a major holiday fumble by accidentally breaking a piece of the host’s dinnerware? “You should certainly offer to replace the broken piece, especially if it has sentimental value for the host or hostess. If you don’t know the name of the pattern or the manufacturer, Replacements offers a free pattern identification service that is a valuable resource,” says Vujinovic.